Ivan Garcia, 4 June 2018 — When it started raining on May 2, Eliseo and his wife had already covered the leaks in the roof of tiles with silicone, wooden planks and pieces of plastic. On the deck, outside, they sprayed waterproof paint and reinforced the iron beams on the roof that run through the house, so they do not collapse. Eliseo and his wife reside in a low-lying area of Old Havana, bordering a railway line, very close to the old Cuatro Caminos Market, and which usually floods any time there is a downpour of moderate intensity. “Since I have had the use of reason, the authorities have been saying they are going to drain the area and build comfortable buildings. It is a tale. In addition to flooding immediately with any storm, 80 percent of the houses are in poor condition. Around here, families establish their own security protocols before a storm hits. “When the rains get worse, my two children go to sleep in the safest part of the house. This time the effects were minor. The roof lasted, only five or six tiles were broken,” says Eliseo, who works as a port stevedore. Almost four weeks of constant rain in the capital caused more than 200 partial or complete building collapses in the municipalities of Habana Vieja, Plaza and Centro Habana. “When the sun came out it was worse. In the last seven days there have been around 120 collapsed roofs or walls. Luckily, there was no need to mourn the wounded or the dead. And luckily the rains in Havana were not as intense as in other provinces such as Villa Clara, Cienfuegos and Sancti Spiritus,” says a municipal housing official. Martí Noticias asked the official if, among the strategies of the new government there is a plan to improve the drainage in the low zones and to build houses for the thousands of Havanans living in precarious conditions and extreme poverty. “There is talk of increasing the construction of houses. According to the government, in a decade this problem could be solved, at least in Havana. But we will have to see. Between the Yankees’ blockade and that of the Cubans themselves, along with the corruption and bureaucracy, I doubt that the deficit of a million houses can be built,” the official believes. The problem of housing is a long-standing issue in Cuba. Fidel Castro planned different strategies. From creating brigades of builders with people who had never used a mason’s trowel to promising to build 100,000 homes per year. The aesthetics and poor quality of most of these constructions meant that even many families residing in houses built three decades ago now need a new dwelling. This is the case for Esther, a primary school teacher, who lives in a ramshackle building built in the late 1980s in a neighborhood in Vedado. “It was about ten o’clock at night when a piece of the ceiling fell in. Fortunately, my daughter was watching television. It’s not the only problem. Years ago, the neighbors of the building have clogs, and roof and window leaks. Some of the stair steps have collapsed and to climb to the fifth floor, where I live, you have to be an acrobat. And that’s not the fault of the blockade or bad weather,” says Esther. On May 27, persistent rains also caused he collapse of a part of a building located at the corner of Muralla and Aguiar streets, in Old Havana. “That building had been declared uninhabitable years ago. After 6:00 in the evening, part of the roof collapsed, causing damage to other rooms. The racket was horrible, but no one was injured or killed,” says Barbara, a neighbor of the property. The intense rains of the subtropical storm Alberto caused 7 deaths and left two missing in Cuba (see note at the end). The greatest damage occurred in the central provinces, especially in Cienfuegos, Villa Clara and Sancti Spiritus. Thousands of hectares of rice, tobacco, fruit trees and crops were spoiled. “Enjoy bananas and pineapple now, because with the losses in Ciego de Ávila, they will be missing from the market for a while,” predicts Omar, a truck driver who transports agricultural products from the center of the island to the capital. 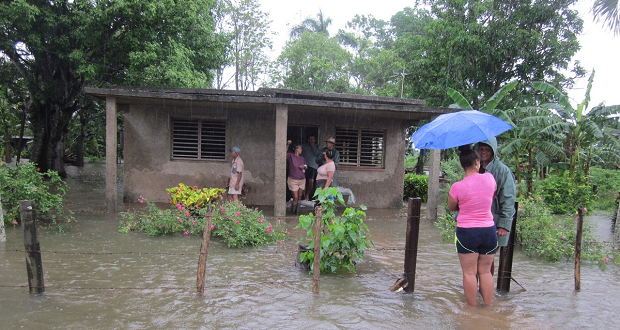 In the town of Ovas, Pinar del Río, 170 kilometers west of Havana, the rains were also very intense. Ovid, owner of a small farm, believes that “a lot of the responsibility for the loss of the crops belongs to the farmers. It was known that the rainy season was coming and the crops needed to be harvested ahead of time, and then the fields plowed. At present, Cubans are concerned about the prices of agricultural products will continue to rise in the markets because of Albert. “If there is a drought it is bad, if it rains a lot, it’s bad too. Let’s see how much the prices go up, any bad weather causes things to get even more expensive,” complains Irma, a housewife. Cuba, a nation that imports everything from toothbrushes to sewing threads, is always exposed to hurricanes, external political situations or the rise or fall of oil prices in the international market. This time it was defeated by the intense rains of a tropical storm. Note: On June 1, Civil Defense issued the names and locations of the seven deceased persons and the two who remained missing. Alejandro Enrique Cumbrera Pérez, a native of Bayamo, Granma, disappeared in the Arimao River, Manicaragua, Villa Clara, and Ricardo Perdomo González, disappeared in Chambas, Ciego de Ávila. The deceased, all of whom died from drowning, are: Daikel Palacios Martínez, 29, from Herradura, Consolación del Sur, Pinar del Río; Eduardo Ramos González, 35, from Sandino, Pinar del Río; Noel Aranda Guerra, 58, from the Batey Crane Nueva, Primero de Enero, Ciego de Ávila; Jailen Venegas Meneses, 26, from Batey Limones Palmeros, Majagua, Ciego de Ávila; Quintiliano Meregildo Simo Ortega, 77, from Manuel Piti Fajardo, Trinidad, Sancti Spiritu; Rosbel López Ríos, 27, from Cayos Las Vacas, Remedios, Villa Clara; and Ramón Cabrera García, 56, in the Cruceros de los Álvarez reservoir, Colón, Matanzas.